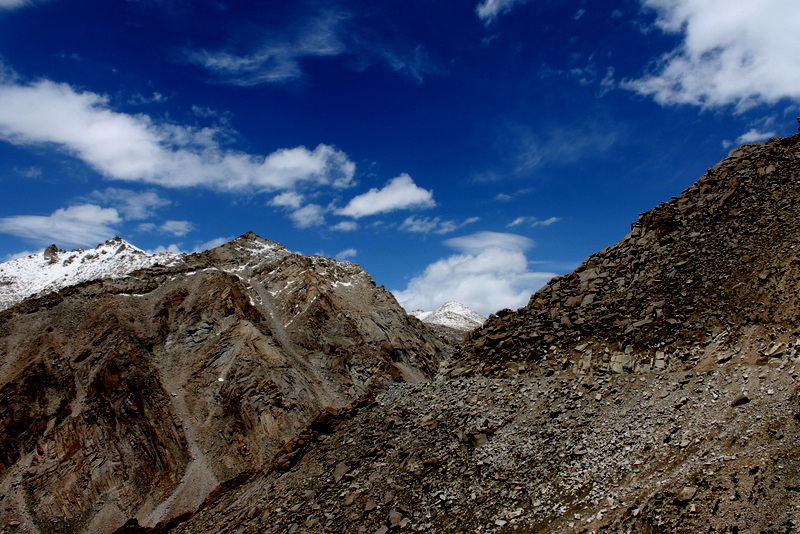 I had returned to Leh after climbing the Khardung-La. But, I had dropped off the cycle at the South Pullu Police station. So, I needed to go and get it back. The next day after breakfast, I went to the start of the road to the pass. I had gone there with the intention of hitch hiking to South Pullu on some goods-carrier. But, by the time I got there all the goods vehicles had already left and only tourist vehicles were still going up. I waited for a long time trying to wave down one of the vehicles passing by. Just when I was starting to lose heart a bunch of guys on Enfields came along. With some reservations in mind I tried to wave them down. One guy stopped and I told him about my situation. He readily agreed to take me up. The guy was an IIT graduate and was working in Delhi. A great guy and we had a very interesting conversation all the way to South Pullu. Our trip plans greatly piqued his interest and we talked a lot about it. Once we got to South Pullu, I got back my cycle and checked the damage to it. 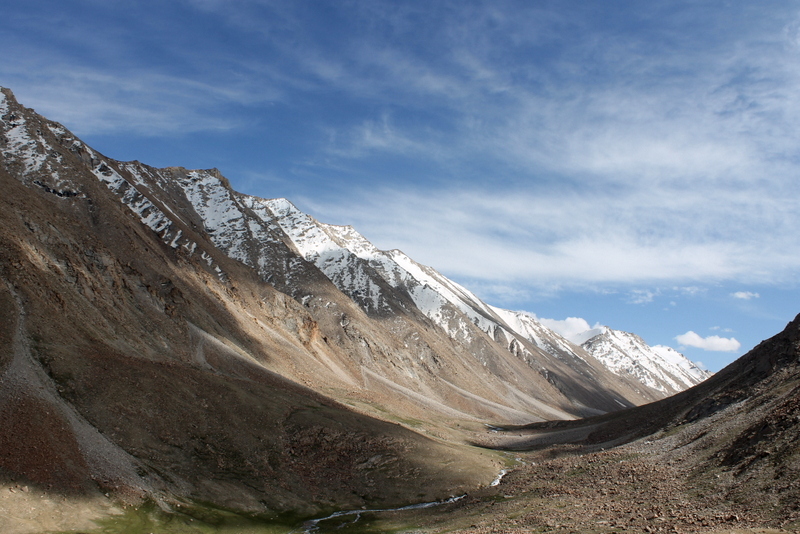 Then I just sat on it and breezed down to Leh. It was a nice experience. 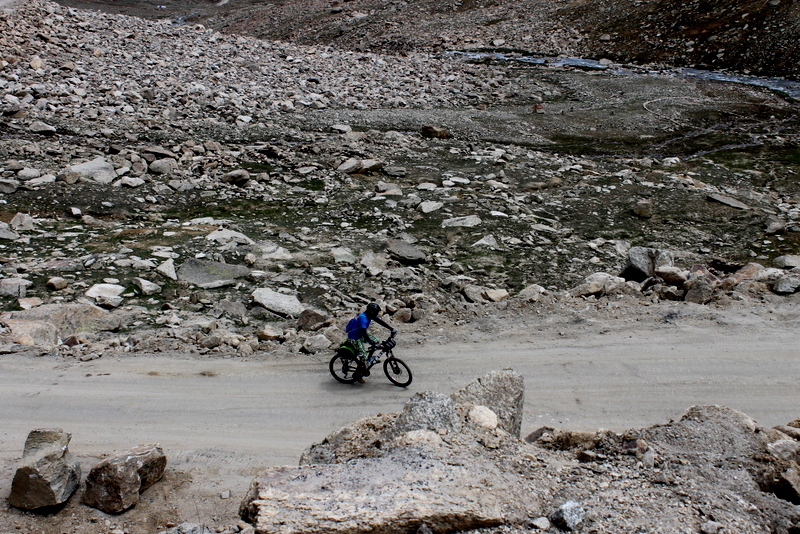 On the way I met a lot of people who were taken up to Khardung La on vehicles and were cycling down. 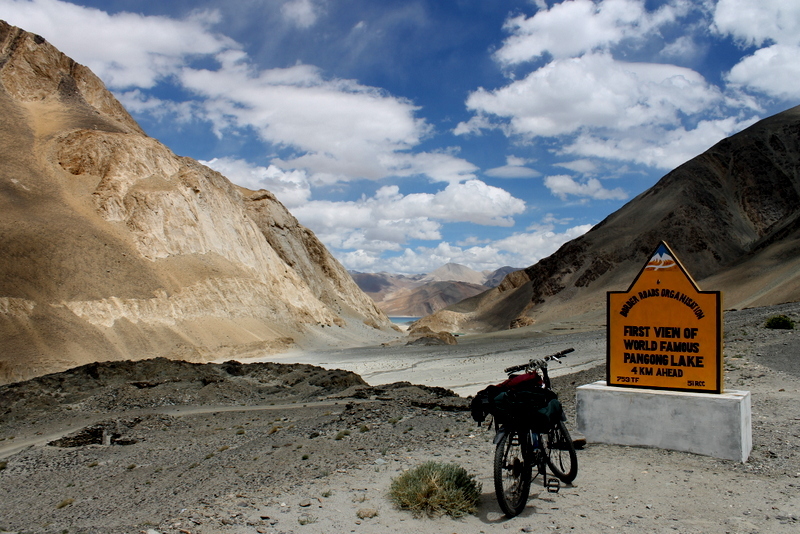 After getting to Leh, I went and fixed the carrier on the cycle. 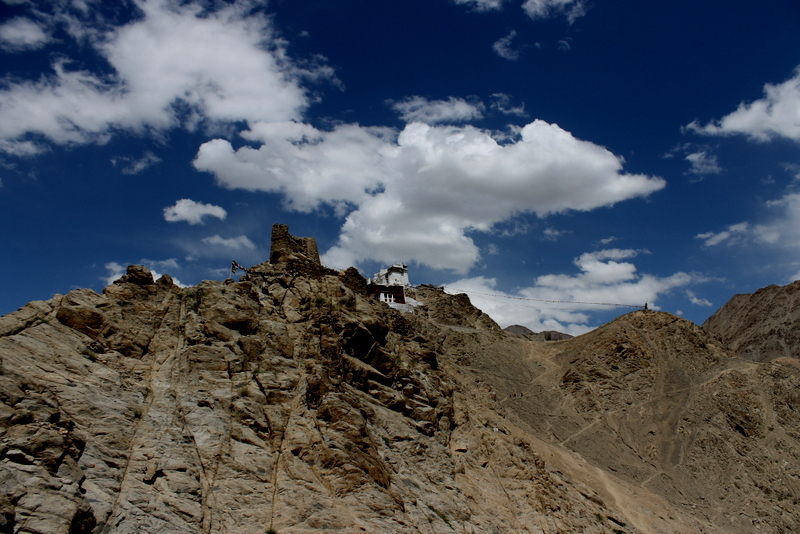 The next day I went to see the Leh palace and cycled around town to see the local sights. That day I met a Gujarati girl and hung out with her for a while and got her a cycle. 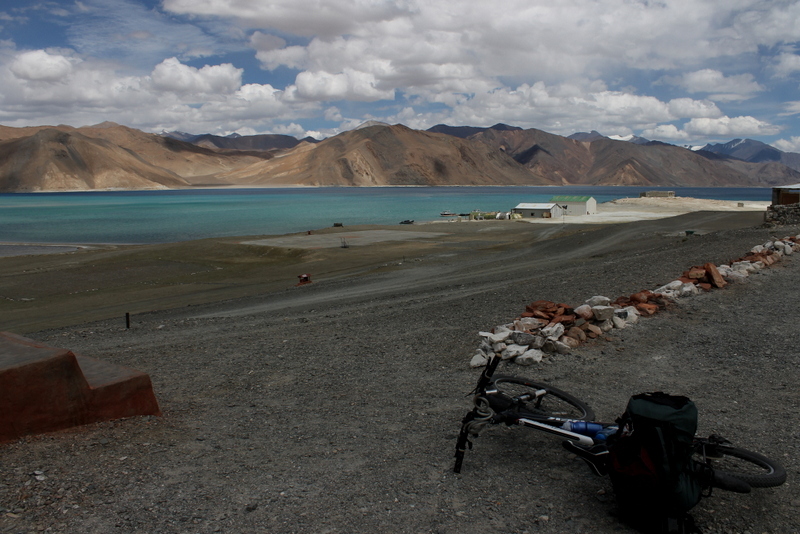 She was thinking of coming with us to Pangong-Tso on cycle but the next day decided to not do it. Anyway, the next day was a big day. No big mountains, no cratered roads awash with ice-melt, no hypoxic deliriums, no need for hypnotic soliloquies, just plain flat easy roads, beautiful scenery and perfect climate all the way. 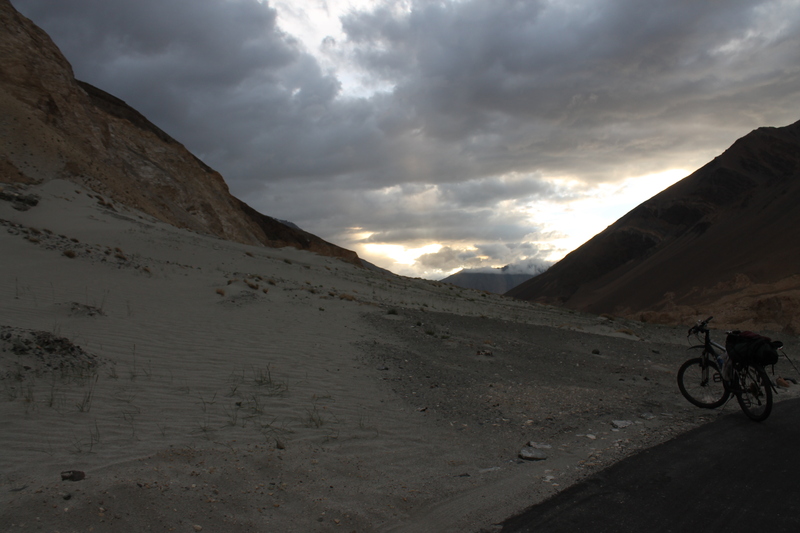 We all really enjoyed the ride from Leh to Karu. There we took a break, got ourselves some tea and momos and then cycled on to Shakthi. When I got there I saw a bunch of guys who were on a cycling trip managed by a tour company camping on a meadow. I went there and spent some time chatting with them. Then I went to a shop there and asked for a room for the night. After going in and checking out the comfortable quarters I asked them to set aside a couple of rooms for us and then sat down for a tea. By then Girish had reached the hotel followed soon by the others. 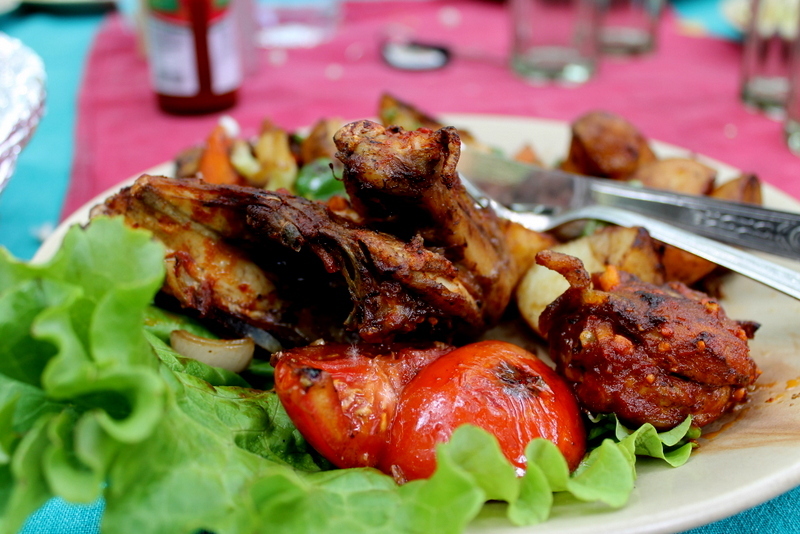 That night we had a hearty meal made by them and slept soundly in the comfortable rooms provided to us. The next day was a big day for us. 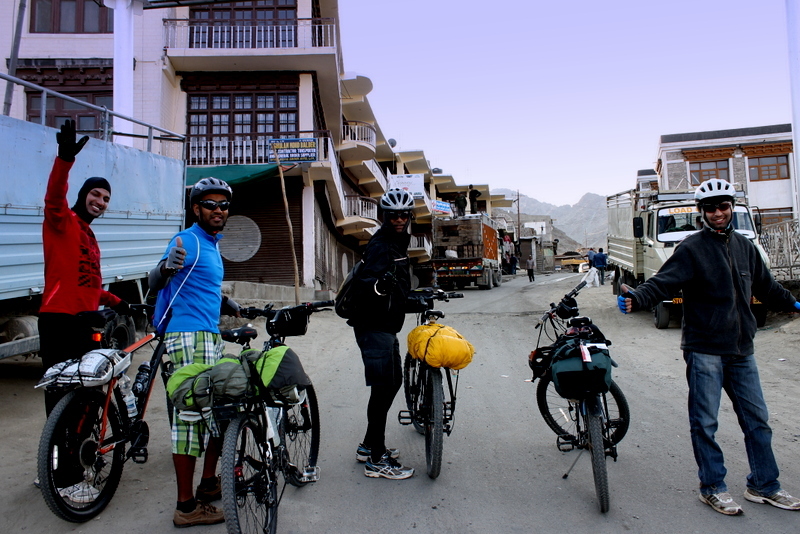 We were planning to cross the Chang-La pass on cycle and then go on to Tang-Tse which is a town en route to Pangong-Tso. 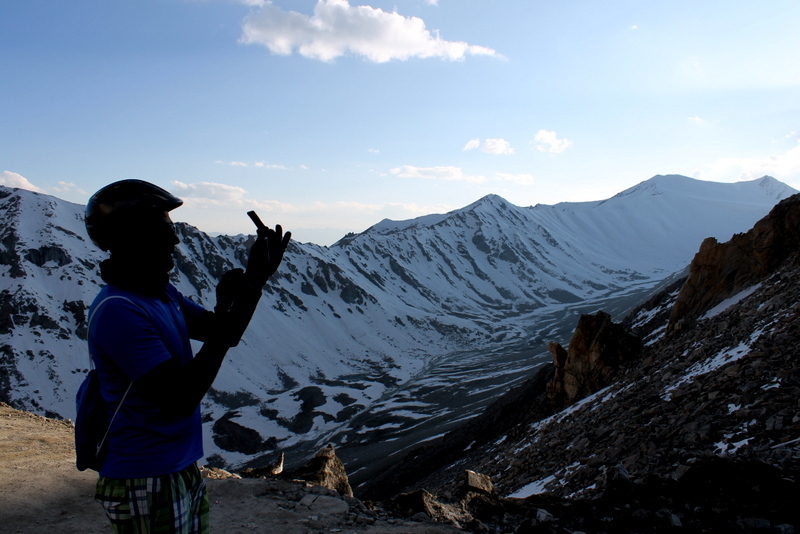 We had learned some lessons from our Khardung-La ride. Every attempt at crossing a pass should be so timed that we get there before noon. Else, the place will be inundated with ice-cold water. This together with the non-existent roads can make cycling really difficult, especially if one is in a fatigued state. So, we started really early. We were all on our cycles and pedaling by 6. The importance of covering a decent distance before breakfast should never be underestimated. 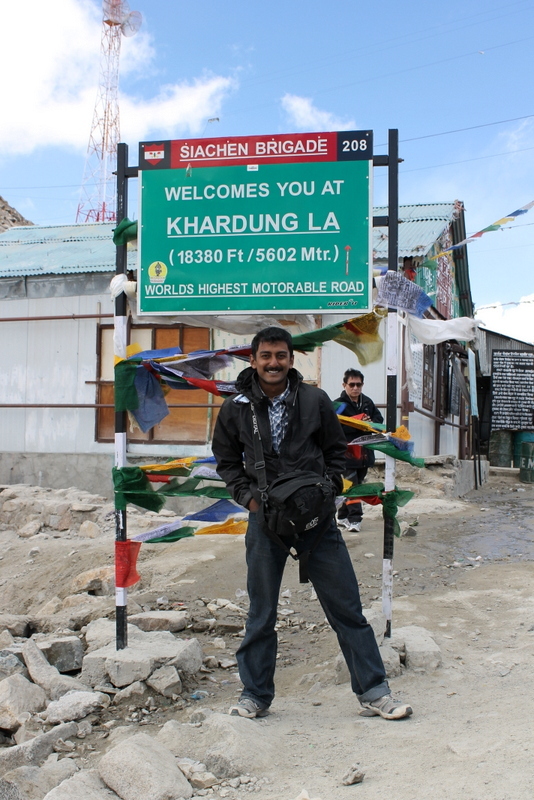 By 9 I and Rajesh had reached the Zingral army base which is situated nearly half-way up the road to Chang-La. We arrived on our cycles to a warm and friendly welcome. 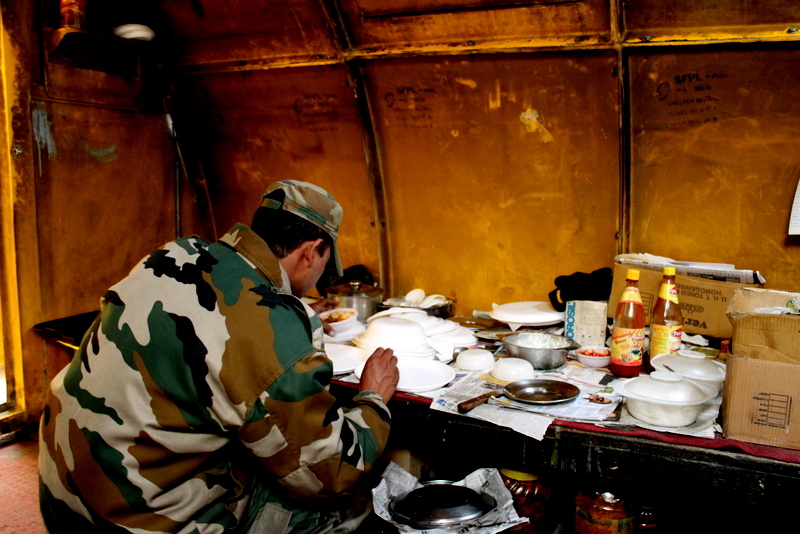 I and Rajesh were taken to the living quarters of the soldiers where we were treated to biscuits and sweet-milky tea. 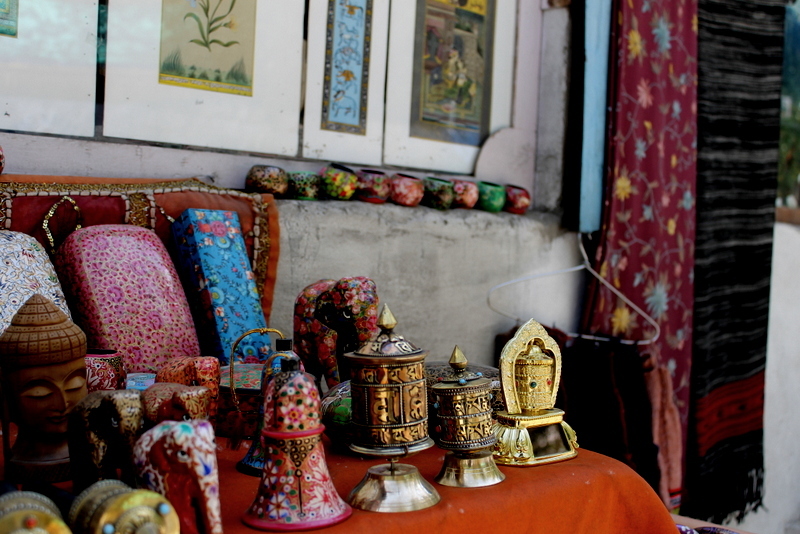 Then we were taken to their kitchen where we had some nice Aloo-parathas and curd. More tea followed. By then the others had joined. After a lot of eating and resting we again set off by 10:30. This time I was feeling strong and was raring to pedal up the mighty slopes. 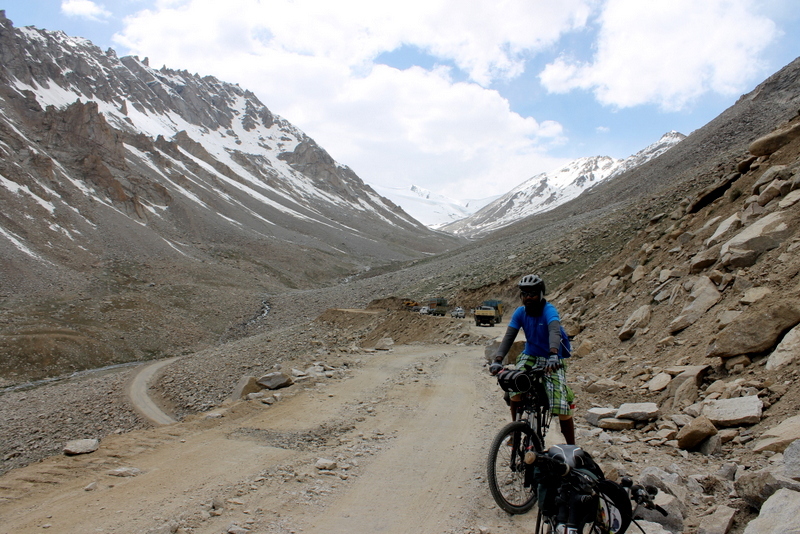 I went ahead and after a couple of hours of enthusiastic pedaling I came to the dreaded roads just below the pass. 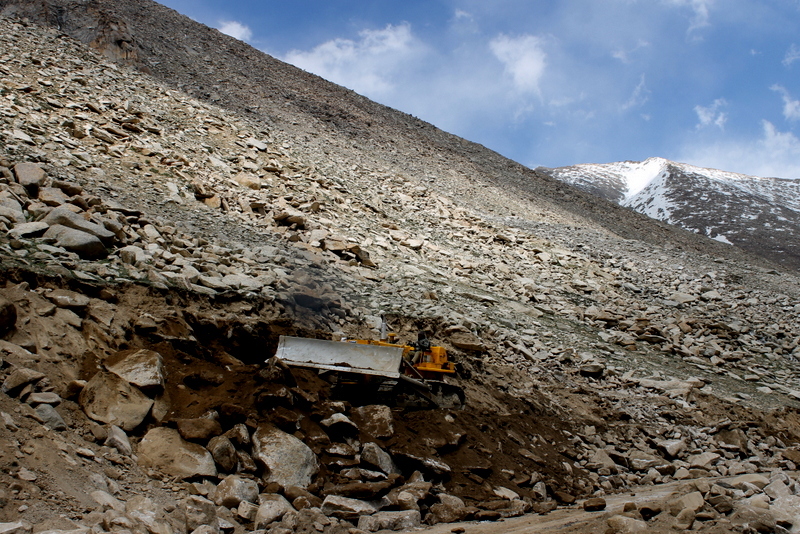 Roads rising at nearly 30-40 degree angles with loose rocks, boulders and under ankle-deep water. But this time The Sabu was prepared. I took off my shoes and socks and tied them to my cycle and put on my plastic slippers and carefully navigated the tricky parts. Behind me one guy’s cycle somersaulted and he fell on his back because he tried to power his way through a particularly steep section. Slowly but surely I made my way up and eventually got to the pass. On the way the Gujarati girl we met 2 days back went screaming by in a taxi waving enthusiastically at us! 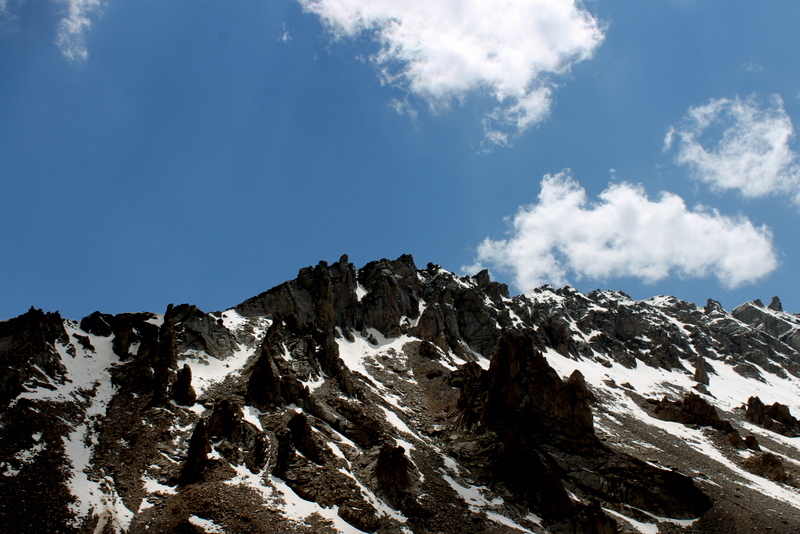 Once I reached the top I quickly took out my gloves and socks and put them on and got a hot tea. By then Jay had come up. He went ahead while I hung back to chat with some soldiers and check out the pretty girls there. Nothing like some old fashioned bird-watching at high altitudes to warm oneself up. Then I set off slowly downhill with one ear tweaked for any weird sounds from my troublesome carrier. I crossed all the streams and eventually got to the good roads. What followed was one of the best experiences of my life. 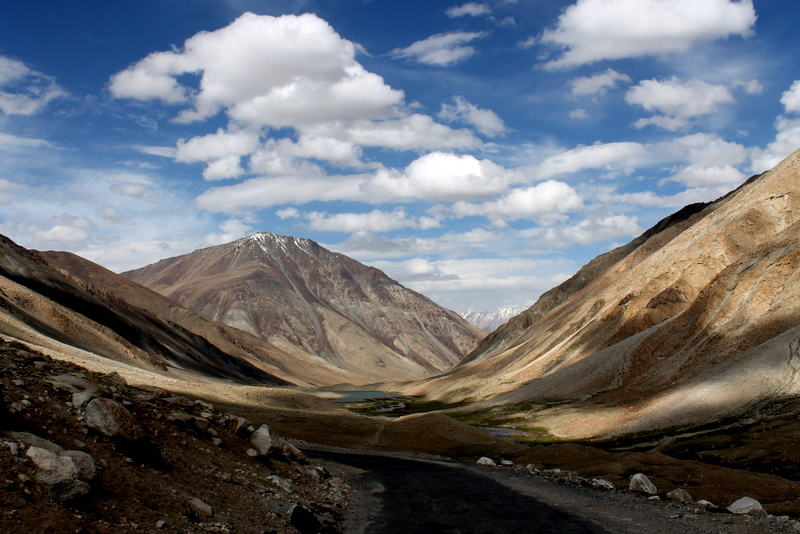 Roads… beautiful, curvy, well-proportioned, silky smooth roads winding and weaving its way through the mountains. Speed, pure, easy, spine tickling speed… It very nearly brought tears of happiness to my eyes. The roads seemed to go one forever and ever. I perched and swooped and posed to my heart’s content. On the road I saw an Enfield guy who had made a landing in a ditch. It reminded me to be more careful. The road went on and on and eventually we got to a small town at the base. Immediately afterwards we ran into some solders in bunkers who gave us lots of juice and nuts. After chatting for a while we went ahead and after 12km of easy cycling got to Tang-Tse. 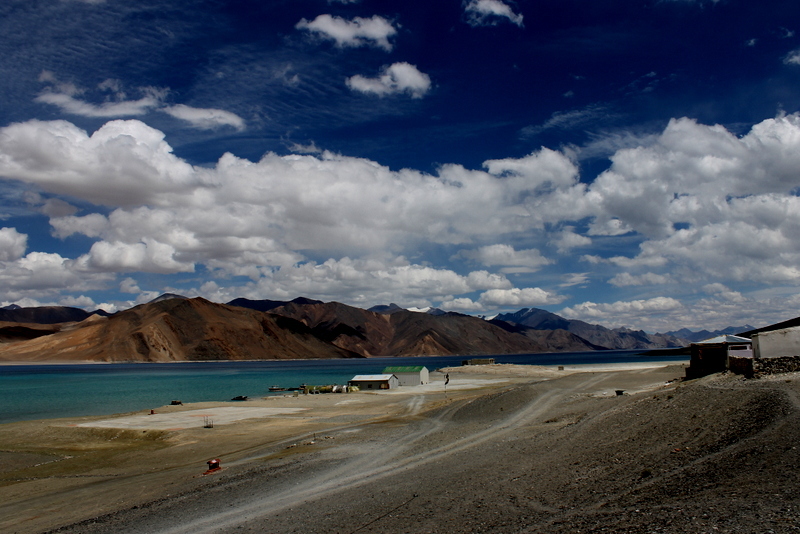 A town which witnessed a sudden flurry of activity after the movie 3 idiots in which Pangong Tso was shown became a hit. That night we halted there. 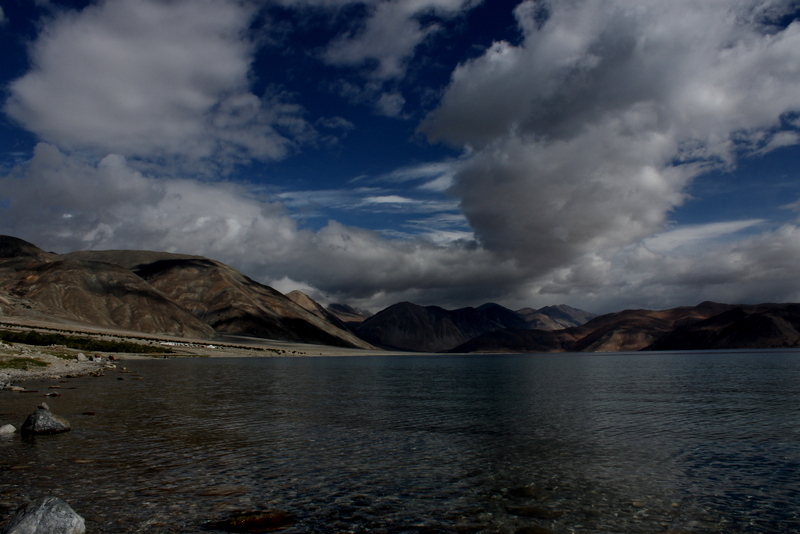 The next day was supposed to be the day we were going to see the blue-green waters of the Pangong Tso. The next day was an easy one. Only a short distance of some 40 kms with both uphill and down-hill sections needed to be covered. Just before noon I reached Lukung on the banks of the lake. The sights were mind-blowing. There was strange aura to the place. Makes you feel like you are not on earth… The clear waters took on the color of the sky and changed color as the day progressed. At Lukung, I took a break for tea and to let my mind calm down and stop screaming FAAACCCCKKKKK!!!! After Lukung the road started thinning and eventually just disappeared. 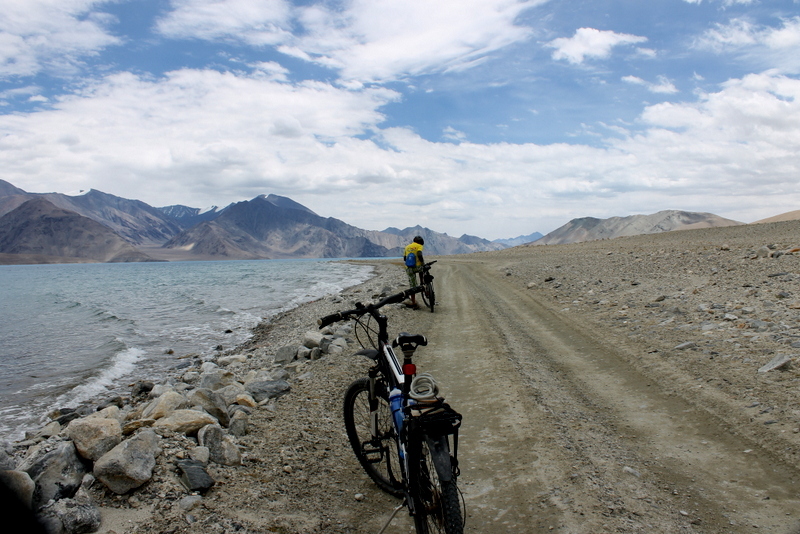 I cycled on along the sandy, pebbly bank of the lake following the jeep tracks. 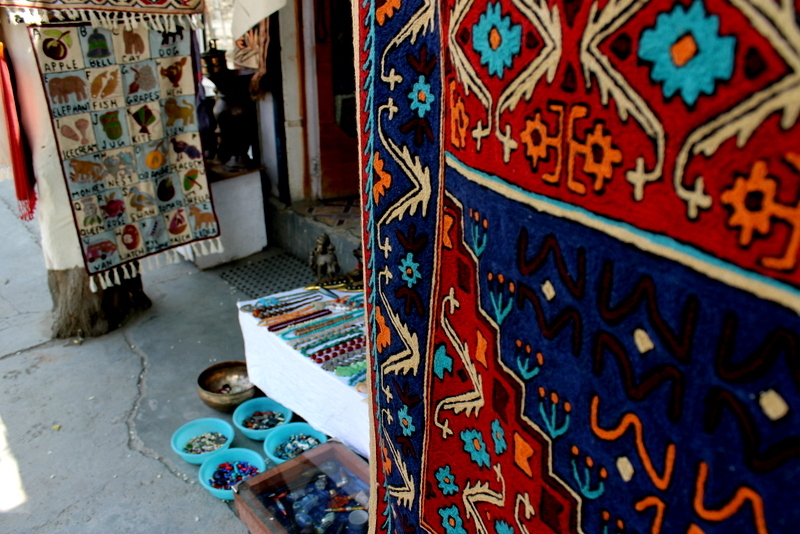 Eventually we came to a sleepy little village called Spangamik where I halted at the Padma guest house. There I unpacked my cycle, wolfed down some lunch and then sat by the lake with the book Into Thin Air and just relaxed till the others turned up. 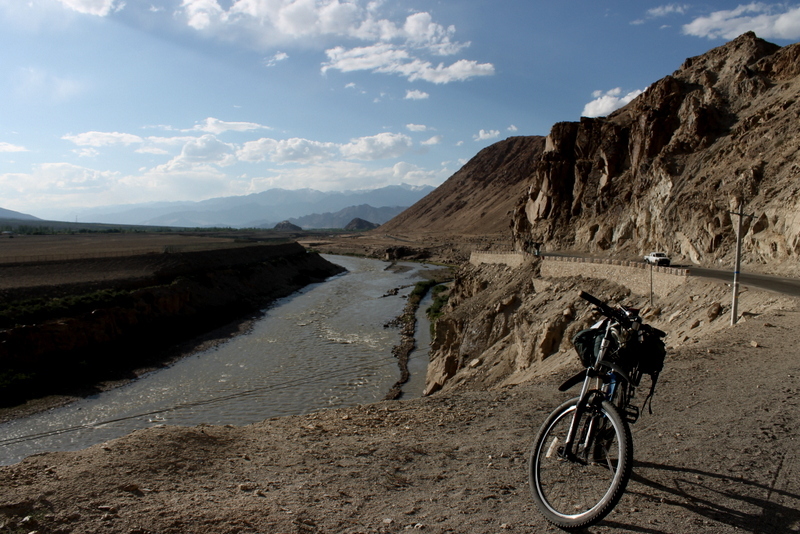 The next day we cycled to Merak and had tea at a small house there and after some off-road fun went back to Spangamik. 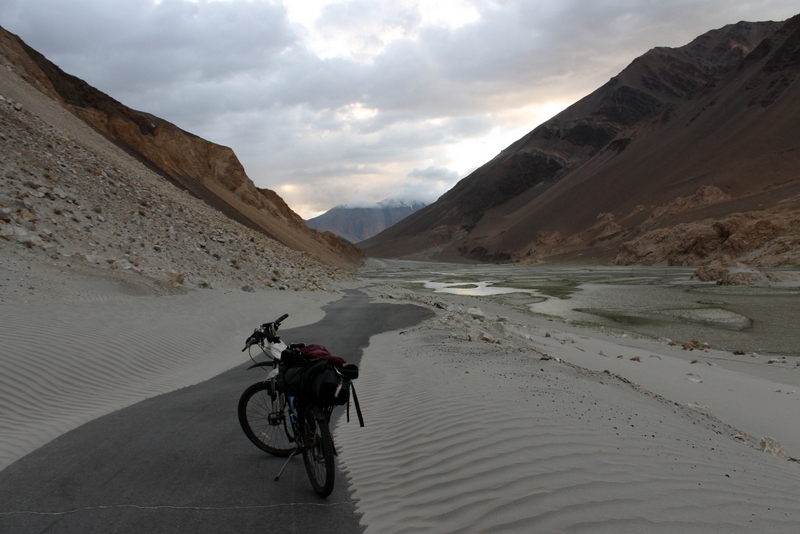 In the evening we decided to cycle to Tangtse from where we planned to get a vehicle to Karu. This was a decision taken in some hurry. 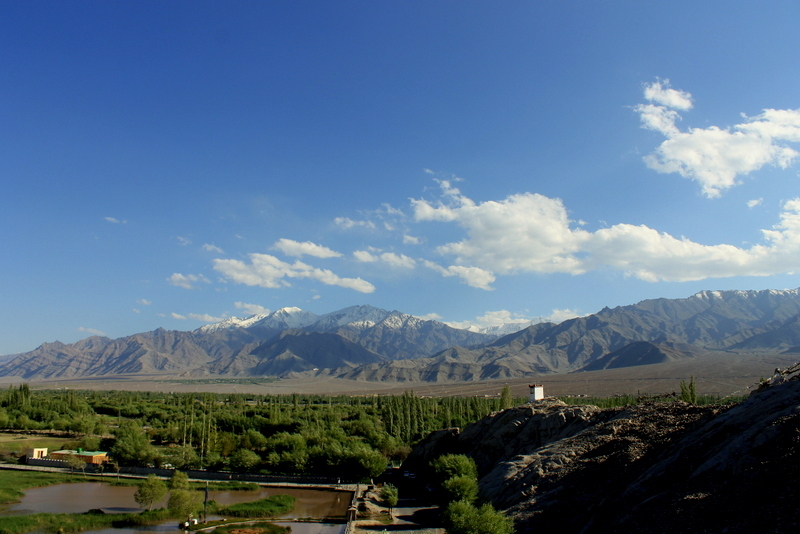 We had barely enough time to make it to Tangtse before sundown. I cycled somewhat briskly and got to Lukung in the afternoon. There I met a Polish guy who was training to be a pro-cyclist for Poland Post. I talked to him about this and that and very soon the others too joined us. We then set off together for Tangtse. As we pedaled on it started getting darker. 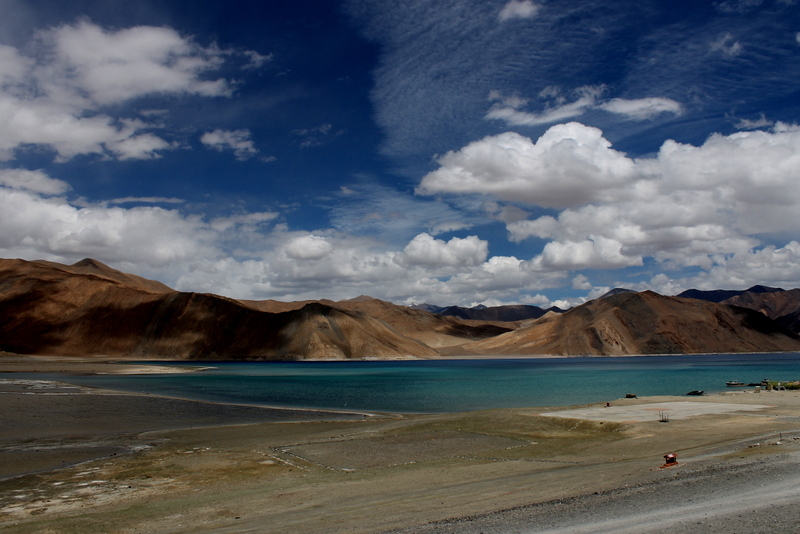 Now, Ladakh might be a beautiful place. But one must never forget that this is a desert and a very unforgiving place. As the sunlight started to vane in the valley, things started to take on an ominous air. Very soon a chill wind started picking up. The road was deserted and the light was failing fast. While we were in Spangamik we met several interesting people. I met a woman from Australia who had given up everything to become a buddhist and was living in India. 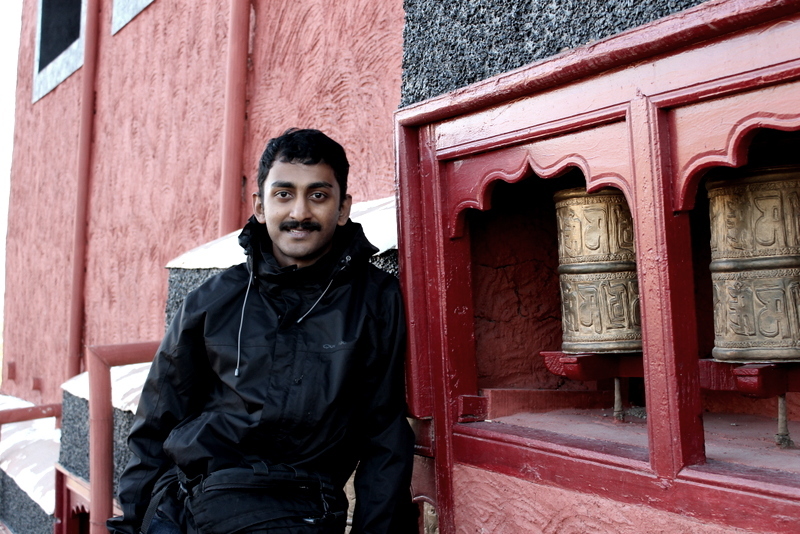 A guy who resigned from a job at Microsoft to travel the world. An elderly gentleman from Sweden(I think) with a cycle older than me who had been cycling and hitchhiking around the world for the past 3 yrs. 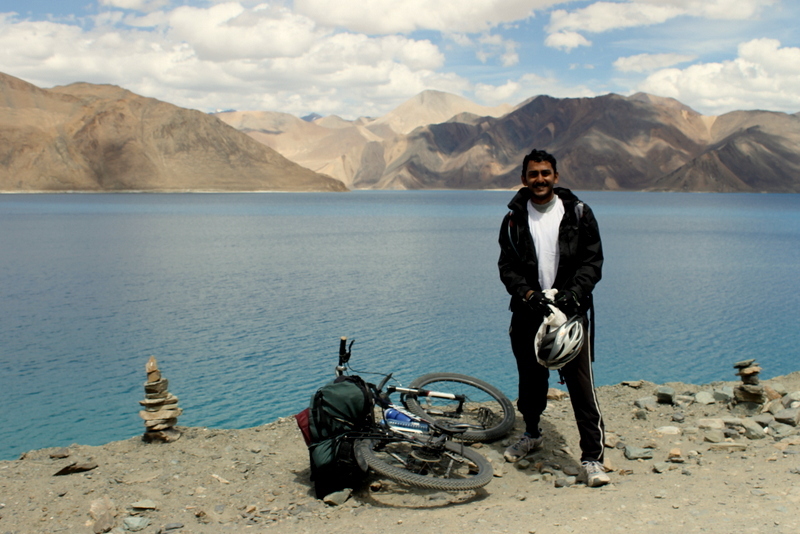 He had covered some 3000kms on cycle and been in several countries and continents. All these made me think a bit. In our society and among our circle of friends there is a beaten track that everybody takes. Everyone who is “normal and intelligent”. We study, become engineers, get a job, study more, get married, have kids and work for them till we die. It is what we see all the time and it is what counts as normal for us. But, there is a world of experience waiting for us outside of this, where people do all sorts of crazy stuff, make tonnes of mistakes and collect wisdom and experience that no amount of money or comfort can buy. If we can see and experience all that for ourselves, I think we will realize that when it comes to humans, there can be no “normal”. For that same reason there can be no end of solutions to the problem of human happiness. The permutations and combinations of possible choices in life are so insanely vast that there can be no real reason for loneliness and boredom… Things could be so bloody exciting! One need only order some adventure to get it. 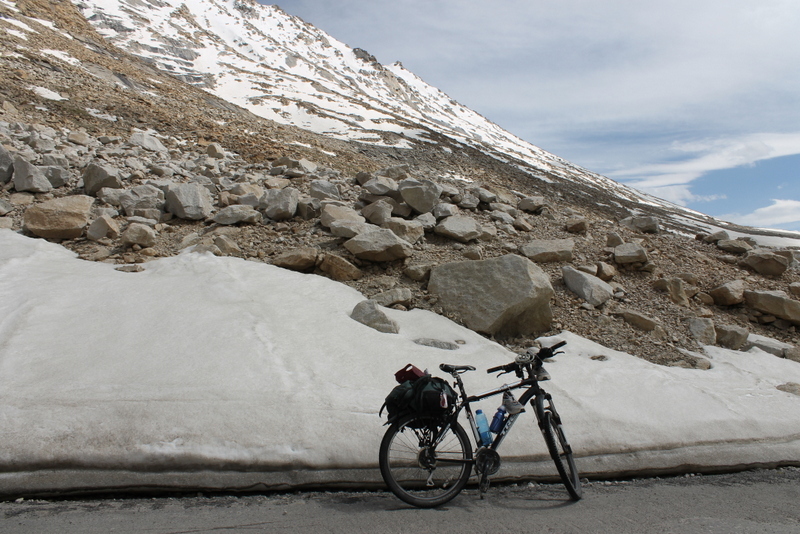 On the 4th of July, this year, I had gone on a cycling trip to the Himalayas. It’s been quite a while since I decided to put down my experiences here. Finally, I have started. 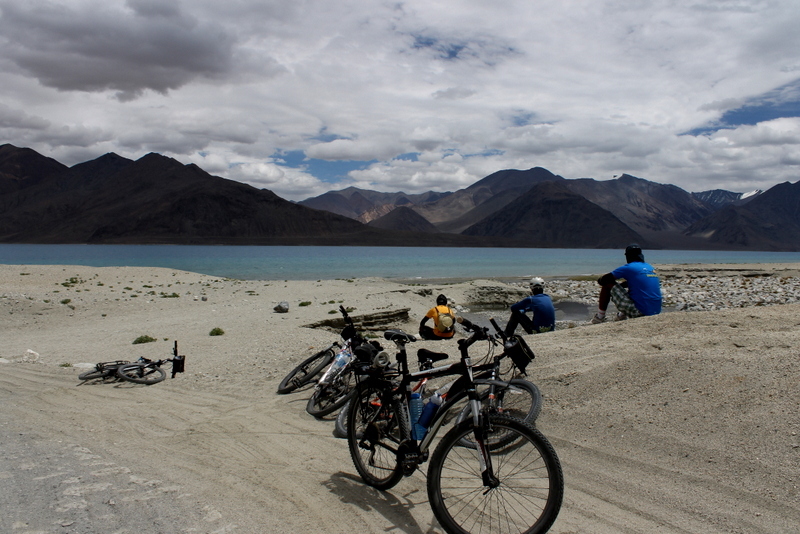 It was after a lot of confusion and frenzied running around that I finally got myself and my cycle on to the plane to Leh. Finally got the cycle box and luggage to the airport by bus!! 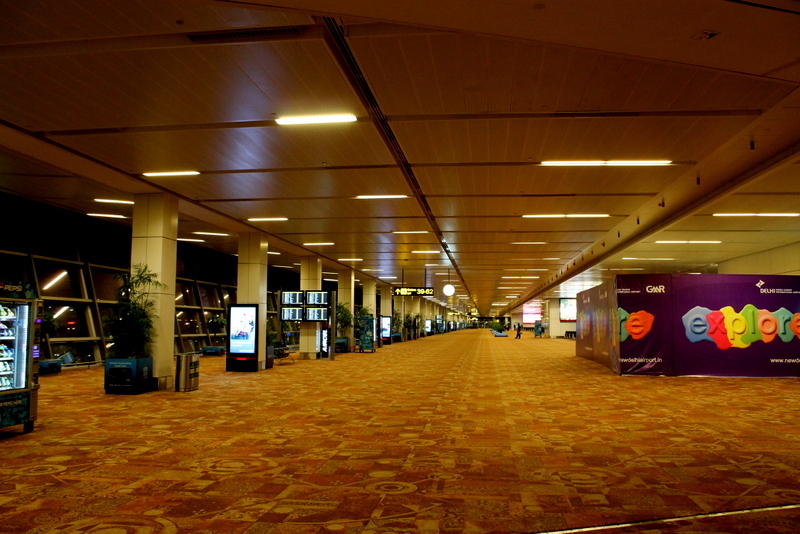 Those 2 hrs were the only moments of peace I had in the run-up to the trip. As I looked out of the window as the plane navigated the stunning and surreal-looking mountains, I, for the first time felt relaxed and finally could feel the thrill and excitement building up inside me. As I stepped out of the plane after a bumpy landing, I caught my first glimpse of the surrounding mountains from ground level. 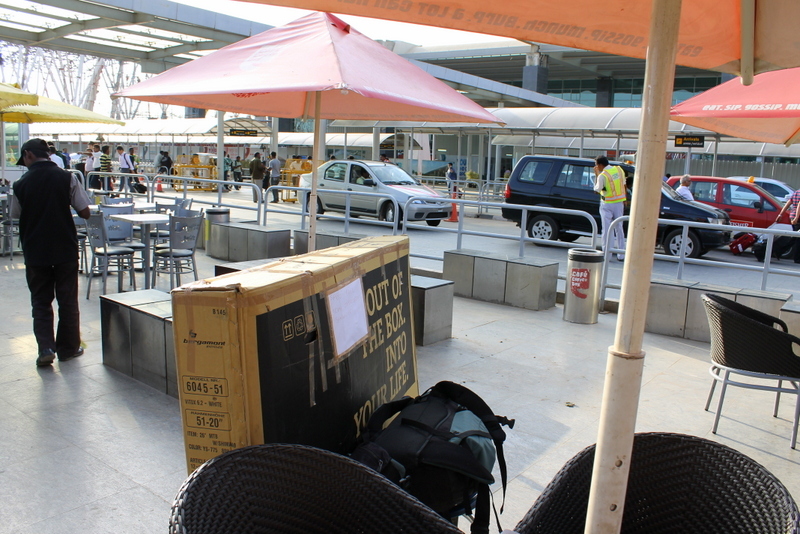 I got my cycle from the luggage check-out and caught a taxi to the hotel where my team-mates who had reached a day earlier than me were staying. I was scared of becoming sick because of the thin air. But, luckily, I did not get even a head ache. I just ate a lot, read and walked about Changspa Road taking in the sights and sounds. In the afternoon I with the help of Vinod put my cycle back together. I then noticed that the rear wheel was a little bent. So, I cycled to a shop where I got the rim trued. The next day we got all the permissions required for our tour plan from the police station. 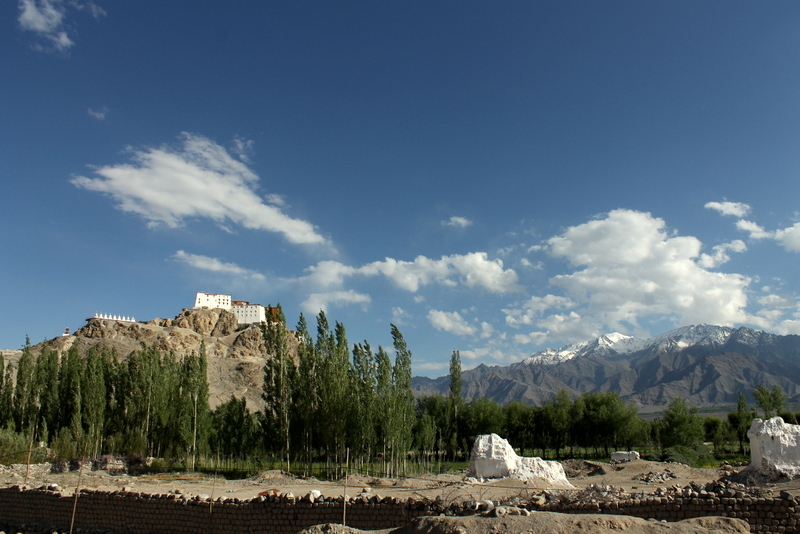 After lunch we decided to go to the Shey and Thiksey monasteries on cycle to see how well we were acclimatized. It was a 20 km ride(one-way). I thought the monasteries themselves were pretty boring. 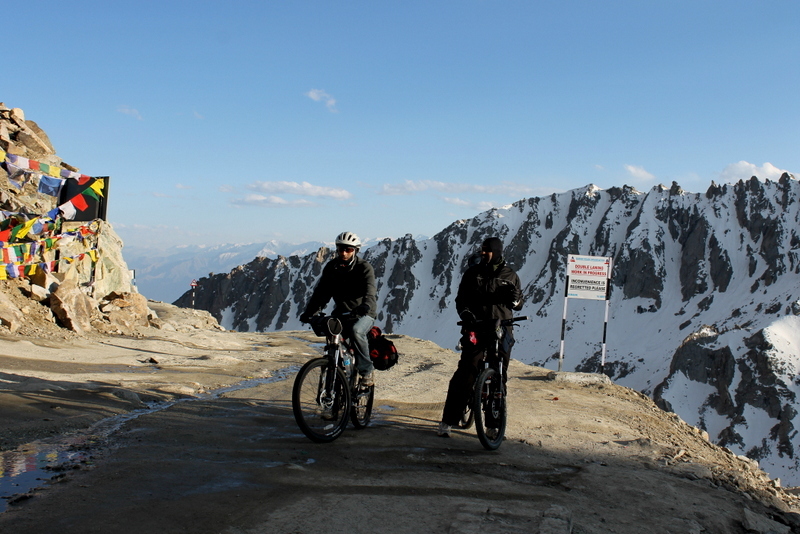 But the sights and sounds along the way and the experience of cycling in the thin air was something truly new to me. After the ride I was thoroughly tired. We all then piled into a hotel on Changspa road and had a hearty dinner. It was after several days that I was finally sleeping peacefully. I could feel that my breathing had become very deep and fast. But otherwise I was more or less fine. This was the day that most worried me before the trip. 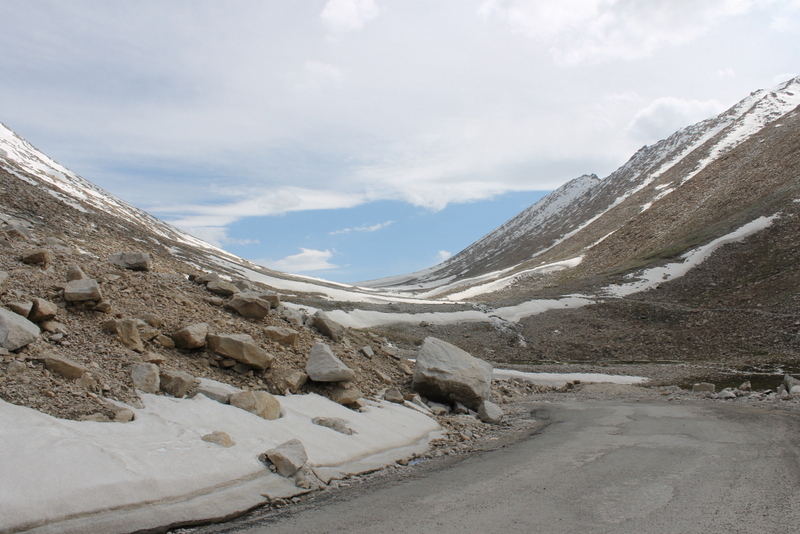 This was supposed to be one of the highest road passes in the world and climbing up to it on cycle with our luggage was a tough proposition. 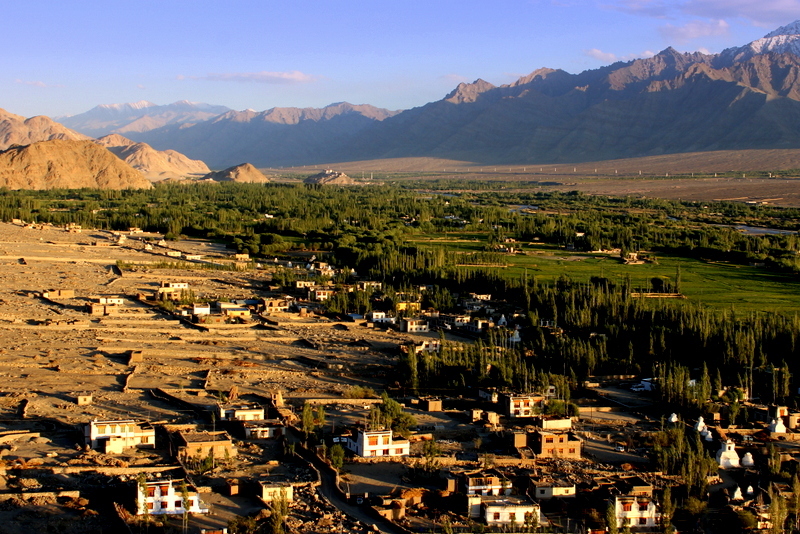 The thought of doing it on the third day of flying into Leh gave me many sleepless nights before the trip. I want to digress now and mention a little thing that struck me. When I was talking about my trip to a friend of mine after coming back, he told me that I should write it all down as fast as possible or I risked forgetting the details. But, I knew that unless a part of my brain was carved out there was no way of that happening. Every single moment of that trip was written in breathless strokes on a canvas of surreal surroundings and strange experiences and were etched so deeply in my mind that they will stay there for quite a while. I have never experienced fatigue, pain, cold or breathlessness to the extent I experienced that day… ever! Only the sights around me and the company of people travelling on the road who stopped to talk to and encourage us kept me going. There were land-slides at several places and it provided me with excuses for much needed breaks. 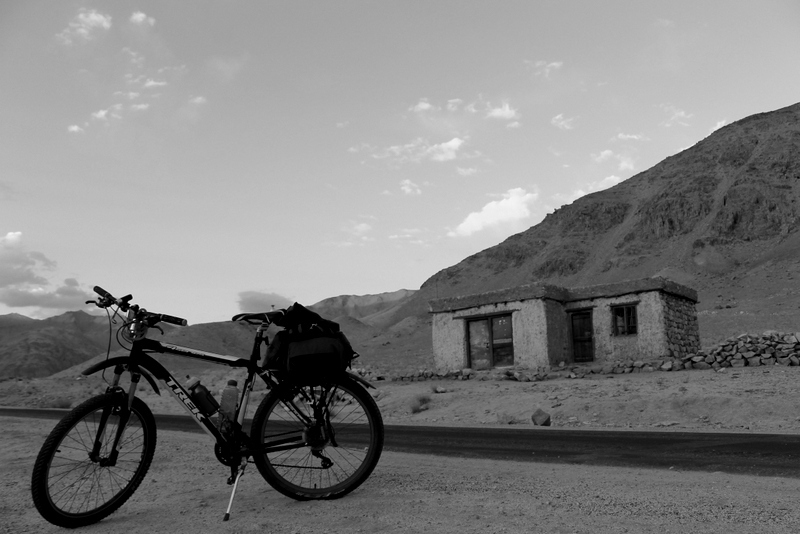 When I reached South Pullu and somehow stumbled into the little Dhaba there for some much needed food and tea, I thought there was simply no way I could cycle another 14 km up. We had ascended some 1000 m and another 1000 m was remaining. Little by little taking breaks we went up. All the time my eyes were set on the highest point. The world’s highest restaurant-500 m ahead. The sun was starting to go down and it was starting to get dark. Finally mustering the last of my energy I pedaled on and came to the army station at the peak. I rode in and collapsed by the side of a building there. Behind me Rajesh, Girish and finally Vinod came up. I spent some time talking to some Malayalee soldiers there. By then the others had moved on. I was starting to become very cold because I was in my cycling shorts and my one foot was exposed. 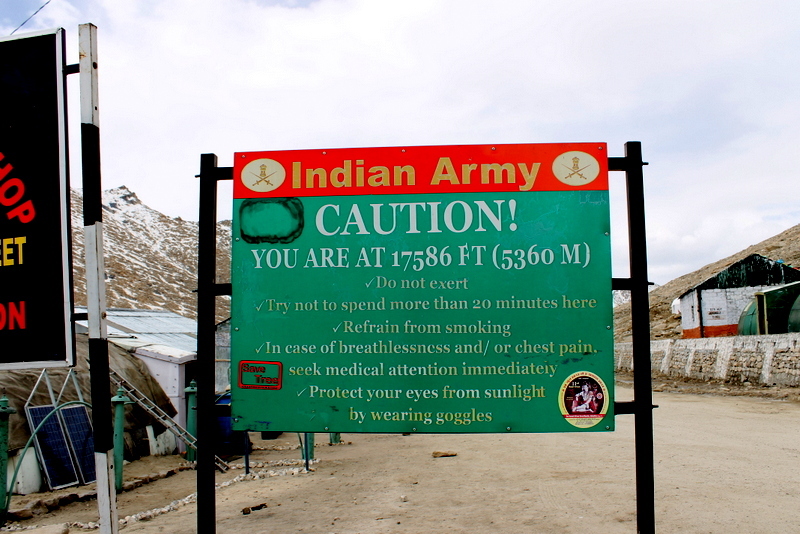 The soldiers advised me to go down on the Leh side as it was easier to get help if I needed it on that side than on the road to Nubra Valley. So, I took their advice and descended on that side. Turned out it was good advice. My cycle carrier broke as I was nearing South Pullu. So, I dropped it off at the police station there and hitched a ride on a sumo. 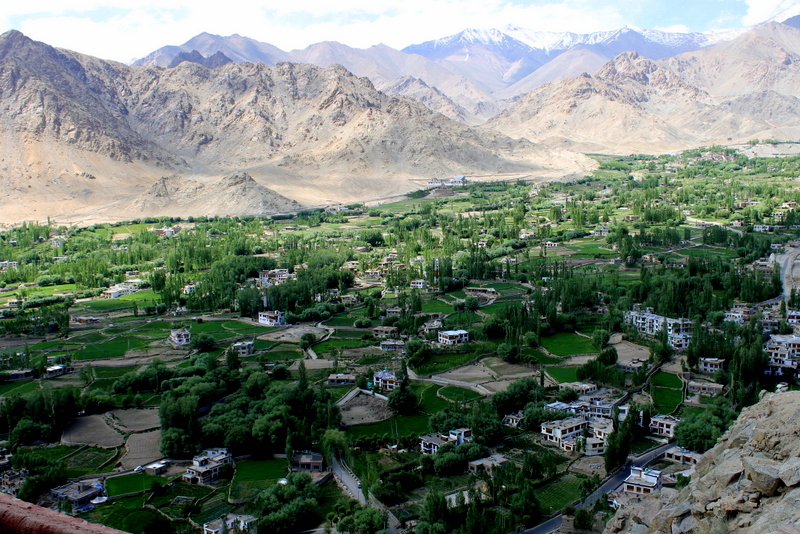 I came down to Leh booked myself a lavish room at The Ladakh Residency and dunked myself in hot water until feeling returned to my hands and legs. 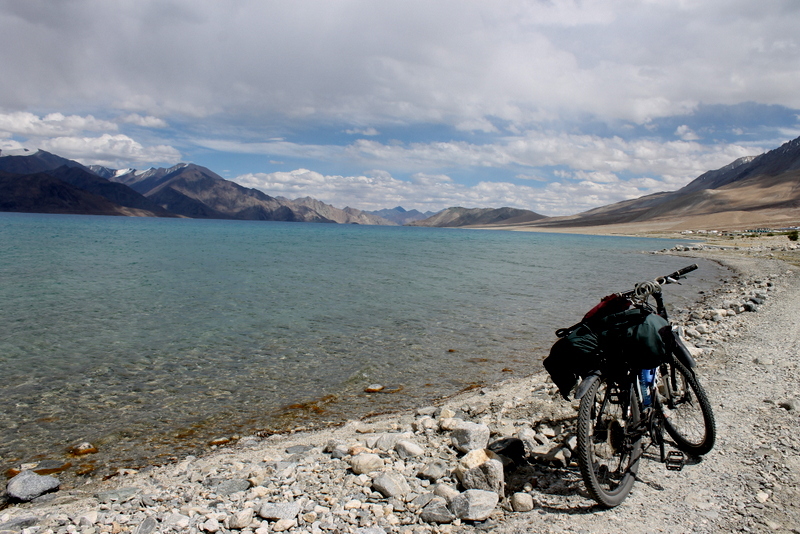 People always ask me why I decided to tour by cycle and not simply travel by vehicle. Why go through the pain and uncertainty? Can’t you see the same things while sitting comfortably inside a car or on a bike? These are good questions. The only time in my life I was able to smile at a camera!